For the past few days, we have been eating snacky kind of food. This evening I thought, I'd made more of an effort and make a proper plate of food. Our plate consisted of Marmite roast potatoes, a slice of lentil loaf and oven roasted Brussels sprouts with garlic. I was rather surprised at my nephew as he actually liked the sprouts. Not many teenagers I know would say they like sprouts! but he did, perhaps because they were roasted. 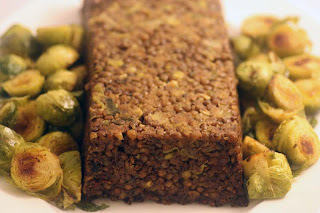 The brown lentil loaf was compact, yet light and packed with flavour. I was just going to roast the potatoes in my usual way, but my nephew recommended coating them with Marmite. Marmite is made from yeast extract, a by-product of beer brewing. Marmite is a thick sticky, dark brown paste often used as a good spread. I've been told its very similar to the Australian Vegemite. It has a very strong and distinct flavour - savoury and salty with umami characteristics, hence the slogan Love it or hate it. I don't love or hate Marmite. My attitude towards it is depicted by my mood. For example, I don't like it spread on toast, but I do like to drink it when feeling a little under the weather and my taste buds need awakening. I was quite curious to try his Marmite roasties. They were actually okay, though I don't think I'd be making them again too soon...maybe if I'm poorly and need some comfort eating. MethodSort through the lentils and discard any stones or grit. Rinse thoroughly. Place the lentils and bay leaves in a large saucepan with 850ml of water. Bring to the boil over a high heat and simmer for a few minutes, skimming off any form that rises to the surface. Reduce the heat, cover and simmer for 45 minutes, or until the lentils are tender. If there is any liquid left at the end of the cooking time, uncover and boil rapidly until the liquid is evaporated. Discard the bay leaves. Heat 1 tablespoon of olive oil in a frying pan and add the leek and sea salt. Saute for a couple of minutes then add the garlic, thyme and rosemary. Saute for a further 5 minutes, or until the leek is tender. Preheat the oven to gas mark 4 and grease a 8 x 4 inch loaf tin. Combine the leek mixture with the cooked lentils. Add the breadcrumbs, tamari, mustard and lemon juice and mix well. Spoon the mixture into the prepared tin and drizzle the remaining olive oil on top. Bake for 45 minutes, or until the top is crispy. Turn out onto a plate, before slicing and serving. Adapted from Aine McAteer Recipes to Nurture. MethodPreheat the oven to gas mark 7. Once you have parboiled the potatoes, drain and set aside. Heat vegetable oil in a large tray. 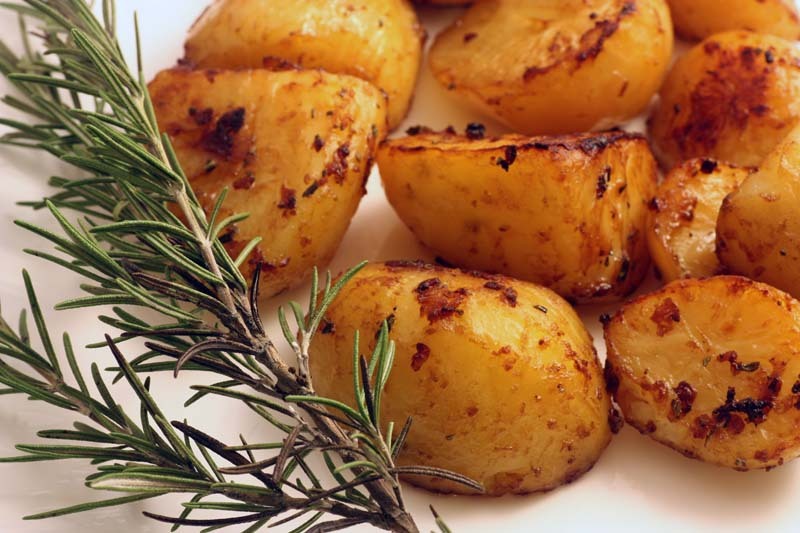 Whilst the oil is heating up, season the parboiled potatoes with salt, pepper and then coat them well with the Marmite. 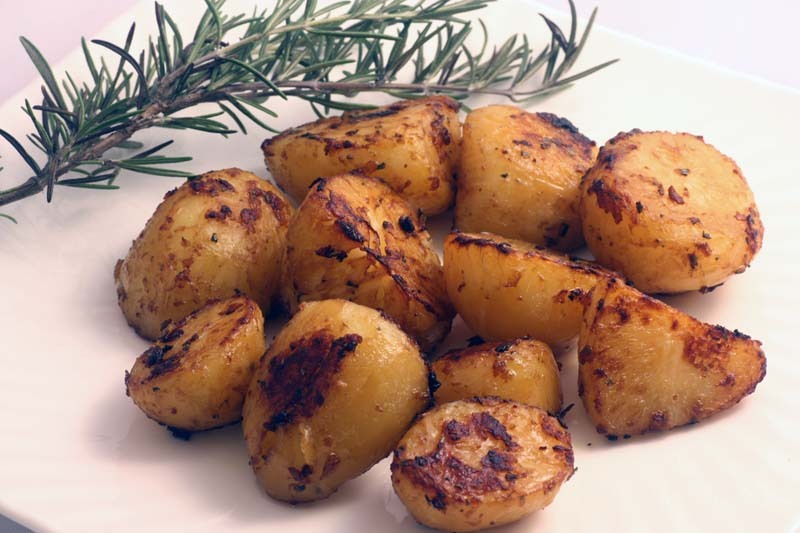 Tip the potatoes into the hot oil and bake for 45 minutes to an hour or until crispy. Make sure you turn the potatoes every 15 minutes so that they are crisp on all sides. Serve immediately. Ooh marmite potatoes - loving the idea of them. I am definitely goin g to try this. I am extremely curious about the Marmite roast potatoes and I`ll try your recipe. Well, I may find some use for that jar of marmite (actually veggimite, they tell me that there is a biiiiiig difference, but I can't comment!) that is aging in my pantry! What a wonderful meal. I like that you can see all the individual lentils in the loaf. And, using marmite on taters is a great idea too! Yum! 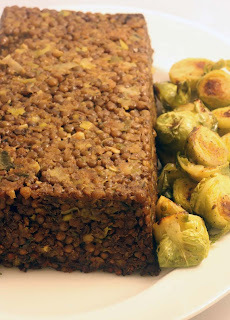 Your lentil loaf looks delicious! I loved meat loaf before going vegetarian and I've seen a couple recipes of lentil loaf since then but didn't get the chance to try yet! Now having totally not helped with positive comments here, I can see how the Marmite would work. Lovely and salty. I think the kids would appreciate them. When my nephew first proposed the idea to me, I thought mmmm student grub. They do work. I can't vouch for the taste difference between veggimite and marmite either, and guess I would have to try it to know for sure. I think people compare them, because they are similar. I agree the individual lentils in the loaf do look pretty. The marmite on tatties were interesting! The lentil loaf is really flavour packed! You must make a version that tempts you. You had me chuckling to myself. I really liked reading your comment (and it doens't always have to be positive, just honest). I agree Marmite and Vegemite doesn't appeal to everyone. Ah, you see I'm a Marmite lover, so those potatoes look like heaven to me! Your blog is looking amazing BTW. It so great to hear from you. Marmite is a very British ingredient. Sorry...I don't know what to compare it to where you are, its very distinct in flavour. Every one of your recipes amazes me in it's creativity and beauty. Consider yourself blogrolled! Thank you so much Bekkitae. And being 'blogrolled' well even better. MMMMMMMMM,..Your lentil loaf looks tremendously tasty!! Those potatoes look fab too! I had never tasted Marmite before but my husband managed to find a jar in a local shop which caters to British tastes. It is interesting, and for the reader who mentioned that she was curious about the flavour, I would say it tastes somewhat like a strong beef extract with slightly bitter undertones. We did like the potatoes very much and will make them again. Thank you mangocheeks. So pleased to read that you enjoyed the Marmite potatoes. I hope the jar wasn't too expensive. I've never ever eaten beef, but agree that Marmite has a meaty flavour. People in the U.K compare it to Bovril, which is made from beef. Sorry, mangocheeks, another post. Tonight we had the lentil loaf and found it tasty, even though I accidentally added 1 Tbsp Dijon mustard, and forgot the soy. Next time, I might add a bit of mashed potato, or even sweet potato to bind it a little before baking in a shaped pan. And, I wonder if Marmite might be a nice addition, perhaps instead of the mustard? Just a thought. Another great recipe with lots of possibilities. Thanks again. Please don't apologise. I'm always delighted to hear from you :) and your variations, thoughts and recommendations on the recipes. I do like the idea of replacing the mustard with Marmite. I'm happy to give that a go. I work for Gravity Road, an agency based in London and we are currently curating various blog posts from around the blogosphere to feature in online articles for a new food website. Humbled. Thank you for letting me know Helenka.